Dilek and I went to a concert of classical music last night. The setting was a small but beautifully restored Roman Catholic church in the Istanbul district of Rasimpaşa. There was a chamber orchestra and a talented young pianist, Nilüfer Kıyıcılardan, playing a programme of Bach, Vivaldi and Mozart. We arrived twenty minutes early and were fortunate to find two of the last unclaimed seats – somewhat surprising, given that the venue is not on any well-beaten social track, and the event had received little publicity. I had stumbled upon it accidentally during the week while researching for this post. These days Istanbul resembles what I imagine New York City to have been during the late 19th and early 20th centuries – a vast construction site. Tunnels are driving under, and bridges over the Bosporus and the Gulf of Izmit; subterranean Metro lines burrow in all directions beneath the city; vast commercial and residential projects rise to the winter sky; hectares of run-down inner city blocks are giving way to new up-market apartments; and domed monumental mosques springing up to occupy landmark sites; all presided over by multitudes of arachnoid construction cranes. Not everyone is happy, of course. I wrote a piece some years ago on a conflict between local residents and guests at an art gallery opening that made international news at the time. Many of us prefer shopping in local traditional small businesses to the homogeneity of climate-controlled malls; and have questions about the wisdom of allowing the national economy to be dominated by a bloated and parasitic financial sector. Local residents whose families may have lived in a neighbourhood for generations are resentful of being pushed out by the new urban yuppie class – some of the latter even mourn the loss of traditional colour that inevitably accompanies such development. Lovers of the atmospheric decay that characterised old Istanbul in recent memory have issues with way restoration is carried out on world heritage buildings. And then there are the megalomaniac property developers who seem to ride roughshod with impunity over zoning and town-planning regulations. Me? I’m ambivalent, I guess. I’m appalled when I look out a window on our university campus and see the abomination of the Ağaoğlu ‘1453’ development blighting what was once a forested landscape. On the other hand, I love the Marmaray Metro, and feel sorry for those who refuse to ride it for fear that the waters of the Bosporus will pour in upon them while their train is half way through. I’m a fatalist when it comes to such matters. But I want to tell you about my recent discovery – the Yeldeğirmeni neighbourhood of Kadıköy. One thing I learned is that the neighbourhood goes by two names. Until recently it was known by its official one, Rasimpaşa, after a small mosque dedicated to a relatively minor Ottoman official who served as mayor of Istanbul for a couple of months in 1878. Tradition says that Rasim’s loving wife, Ikbal Hanim, had the mosque built on the site of an earlier ruin. Be that as it may, more picturesque, and arguably more significant is the district’s earlier history. Tourist brochures about Istanbul often mention that Khalkedon (Kadıköy) was originally a larger city than Byzantium/Constantinople across the water. The name is translated as ‘City of the Blind’ in tribute, apparently, to the failure of its inhabitants to recognise the obvious superiority of the other site. Dating from 675 BCE, its defensive walls are believed to have extended as far as Rasimpaşa. The Asian city’s importance waned after the foundation of Constantinople as capital of the eastern Roman Empire. Following its conquest by the Ottomans, its environs became a popular location for the city’s elite to build summer mansions on the banks of the Haydarpaşa Stream that once flowed there. There were also barracks and a training ground for imperial cavalry and infantry. The Marmaray Metro line currently terminates at a station in front of the modern Tepe Nautilus shopping mall. The station is called Ayrılık Çeşmesi, and the eponymous fountain was the gathering point for Ottoman armies departing on campaigns to the east, and caravans of pilgrims setting out for Mecca. As an interesting aside, the fountain is said to have been commissioned by Kızlarağası Gazanfer Ağa – whose title refers to his responsibility for the ladies of the imperial harem. Nice work if you can get it! In the late 18th century, Sultan Abdülhamit I had several windmills erected to supply the needs of the military and local residents – and from the Turkish word for windmill (yel değirmeni) comes the name that is supplanting the memory of that short-lived city mayor. 5659 in the Jewish calendar = 1898 C.E. From the mid-19th century Rasimpaşa began to take on a more residential character. The present pattern of streets was laid out, and Istanbul’s first post office opened there. The city had always been prone to disastrous fires, and after a particularly bad one that devastated the Kuzguncuk district, Jewish families moved in and established Istanbul’s first apartment buildings. The Hemdat Israel Synagogue, one of the oldest surviving in Istanbul, entered service in 1899 after Sultan Abdülhamit II stepped in personally to moderate in a violent quarrel between the Jews and the Orthodox and Armenian communities. It seems Christians objected to the construction of a synagogue in the district. It is said that the Jewish community named the synagogue in a way that recognised their gratitude to the sultan for his assistance – the Hebrew consonants for ‘Hemdat’ can also be read as ‘Hamid’. Anyway, in the interests of natural justice, the Orthodox lot were allowed to erect their own place of worship, the church of Ayia Yeorgios, a few years later in 1906. Both buildings are still standing, though their congregations have been sadly depleted over the years. Development became more rapid in the early 20th century with the building of the Haydarpaşa train station as a key link on the Berlin-Baghdad railway line. Italian stonemasons came to work on the project, as well as German architects, engineers and builders. The edifice that currently serves as Orhangazi Primary School was also built around this time to provide education for the children of the German professionals. Among the more noteworthy apartment blocks from this time are the five-storey Italian (Valpreda), Demirciyan and Kehribarcı buildings. 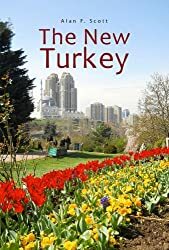 Underlining the multicultural character of the district, and the tolerant attitude of the Muslim Ottoman government, Roman Catholics even managed to get a big foot in the door. A gaggle of nuns calling themselves the Oblates of the Assumption established a school in the name of St Euphemia in 1895. RC education continued here until some kind of dispute took place with the Republican government in 1934. As a result, the nuns departed and the school was taken over by the Turkish Ministry of Education, eventually assuming its present role as Kemal Ataturk Anatolian High School. Next door to the school is the small (now deconsecrated) church dedicated to Our Lady of the Most Sacred Rosary, where Dilek and I were privileged to hear last night’s delightful concert. Sadly, the tide of history brought cataclysmic events on to the world stage that destroyed the harmony of those halcyon days – waves of violent nationalism, the slaughter of the First World War, the Greek invasion of Anatolia, and the Turkish War of Liberation. The world would never be the same, and Istanbul suffered as much as anywhere. I was motivated to explore the neighbourhood after visiting a café recently, run by the daughter of a friend. Trendy cafés are sprouting there like truffles in a Piedmont autumn, and Kamarad is one of the latest. İnci and Cem are catering to the true coffee connoisseur, importing beans from various sources in Africa (Kenya, Ethiopia) and South America (Honduras, Costa Rica, Columbia), roasting and grinding them on site, and offering delicious brews produced by the method of your choice: the familiar espresso machine and French press, or more esoteric techniques, chemex and V60. They are also supplying beans to other businesses nearby. One of the more striking features of the new Kadıköy is the proliferation of enormous surrealistic outdoor murals that confront you unexpectedly as you stroll around the narrow back streets. Kadıköy Municipal Council has sponsored an annual street art festival, Mural-İst, for the last four years. Seven local and nine foreign artists have turned their talents to the enlivening of the neighbourhood, with impressive results. The old days will never return, of course, but the new/old district of Yeldeğirmeni may be showing the way to a better future. Oblates, it seems, are one step down in the holy orders, following less stringent rules than is usual for monastic orders.